Grappa became through the years a real “Made in Italy” symbol, thanks especially to the many distilleries that keep producing grappa with passion with the goal of make it known. Initiatives like for example “Distillerie Aperte” and “Grapperie Aperte”, that take place every year in between the end of September and the beginning of October, offer the chance to keen and non-keen people to let themselves enchant by the some 40 productive realities in the Italian territory that contributed to make Grappa become a distillate appreciated all over the world. The distilleries adhering to this event will guide a route towards the discovery of the distillation secrets and its variety and aromas on Sunday 7th October 2018, from 10 am. For information about “Distillerie Aperte”, a “Made in Vicenza” initiative, you may consult the webpage: www.madeinvicenza.it. 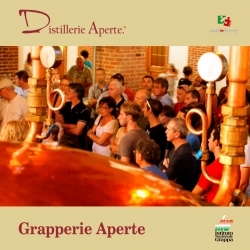 For any useful information about “Grapperie Aperte”: www.istitugrappa.org.